Grace’s 5-year old daughter has been constantly pulling her hair this weekend. She also seems irritable and keeps on pulling her right ear. On Sunday, Grace’s daughter developed a high fever and discharges are coming out of her right ear. Grace brought her daughter to the emergency department and was informed that her daughter has otitis media. Otitis media is very common among children. Otitis media is an inflammation of the middle ear without reference to etiology or pathogenesis. It can be classified into many variants based on etiology, duration, symptomatology, and physical findings. In children, developmental alterations of the eustachian tube, an immature immune system, and frequent infections of the upper respiratory mucosa all play major roles in AOM development. The most important factor in middle ear diseases is eustachian tube dysfunction, in which the mucosa at the pharyngeal end of the ET is part of the mucociliary system of the middle ear. 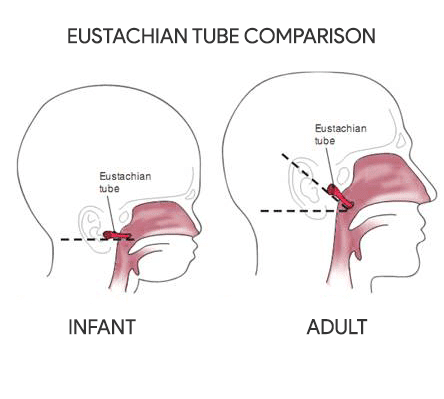 The eustachian tube in an infant is shorter and wider than in the older child or adult. The tube is also straighter, thereby allowing nasopharyngeal secretions to enter the middle ear more easily. Interference with the mucosa by edema, tumor, or negative intratympanic pressure facilitates direct extension of infectious processes from the nasopharynx to the middle ear, causing otitis media. 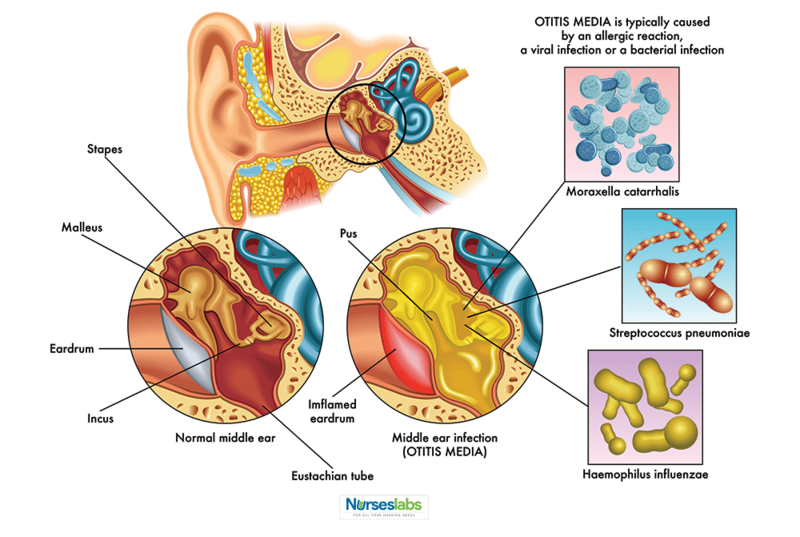 Otitis media is one of the most common infectious diseases of childhood. Two of every three children have at least one episode of otitis media by the time they are 1 year old. Otitis media accounts for approximately 20 million annual physician visits. Various epidemiologic studies report the prevalence rate of acute otitis media to be 17-20% within the first two years of life. One-third of children experience six or more episodes of otitis media by age 7 years. Peak prevalence of otitis media in both sexes occurs in children aged 6 to 18 months. A multitude of host, infectious, allergic, and environmental factors contribute to the development of otitis media. Immature immune system. Otitis media is an infectious disease that prospers in an environment of decreased immune defenses. Genetic predisposition. Although familial clustering of otitis media has been demonstrated in studies that examined genetic associations of otitis media, separating genetic factors from environmental influences has been difficult. Anatomic abnormality. Children with anatomic abnormalities of the palate and associated musculature have a higher risk for otitis media. Physiologic dysfunction. Abnormalities in the physiologic function of the ET mucosa increase the risk of bacterial invasion of the middle ear and the resultant otitis media. Bacterial pathogens. The most common bacterial pathogen is Streptococcus pneumoniae, followed by Haemophilus influenzae, and Moraxella catarrhalis. Infant feeding methods. Many studies report that breastfeeding protects infants against otitis media. Otitis media should be suspected in children with a history of characteristic head-neck and general symptoms. Otalgia. Young children may exhibit signs of otalgia by pulling on the affected ear or ears or pulling on the hair; otalgia apparently occurs more often when the child is lying down. Otorrhea. Discharge may come from the middle ear through a recently perforated tympanic membrane, or through another perforation. Headache. An older child may complain of a headache. Symptoms of upper respiratory infection. Concurrent or recent symptoms of URI, such as cough, rhinorrhea or sinus congestion is common. Fever. Two-thirds of children with otitis media have a history of fever, although fevers greater than 40°C are uncommon. Irritability. Irritability may be the sole early symptom in a young infant or toddler. Laboratory tests. Laboratory evaluation is usually unnecessary, although many experts recommend a full sepsis workup in infants younger than 12 weeks who present with fever and otitis media. Tympanocentesis. The criterion standard in the diagnosis of otitis media is tympanocentesis to determine middle ear fluid, followed by culture of fluid to identify causative pathogens. In 2013, the American Academy of Pediatrics (AAP) and the American Academy of Family Practice published updated guidelines on the medical management of otitis media. Antibiotic therapy. Among other recommendations, the guidelines recommended antibiotics for bilateral and unilateral otitis media in children aged at least 6 months with severe signs and symptoms. The FDA has approved more than a dozen antibiotics to treat otitis media. Antimicrobial agents. These agents remove pathogenic bacteria from the middle ear fluid. From the beginning, it is essential to integrate surgical management of otitis media with medical treatment. Myringotomy and TT placement. Myringotomy or the incision of the eardrums may be performed to establish drainage and to insert tiny tubes into the tympanic membrane to facilitate drainage. Adenoidectomy. The performance of adenoidectomy to treat patients with otitis media has generated extensive discussion and research, though potential benefits are controversial. 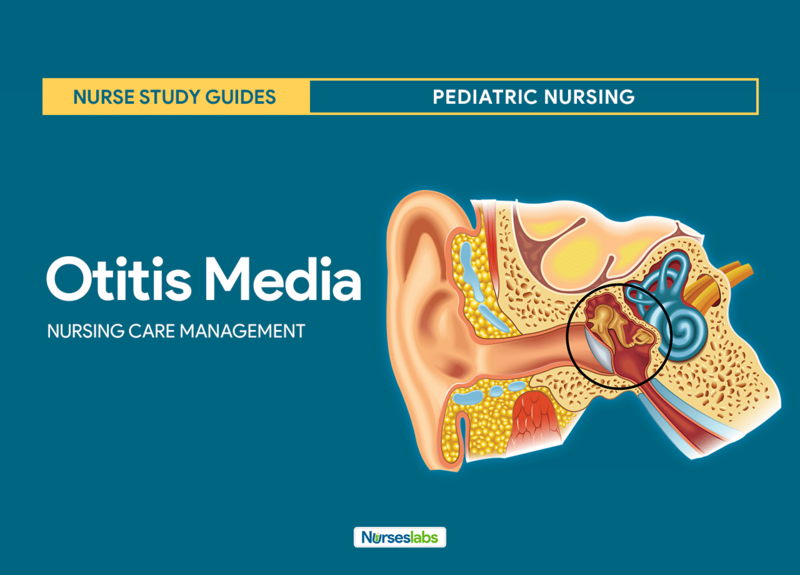 Most infants and children with otitis media are cared for at home; therefore, a primary responsibility of the nurse is to teach the family caregivers about prevention and the care of the child. Physical examination. The infant’s ear is examined with an otoscope by pulling he ear down and back to straighten the ear canal. History. Assess if there is a history of trauma to the ears, affected siblings, a history of cranial/facial defects or any familial history of otitis media. Acute pain related to the inflammation of the middle ear. Anxiety related to health status. Impaired verbal communication related to effects of hearing loss. Disturbed sensory perception related to obstruction, infection of the middle ear, or auditory nerve damage. Risk for injury related to hearing loss, decreased visual acuity. Infection related to presence of pathogens. The child or parent will indicate absence of pain. The child will be free of infection. The parents will state understanding of preventive measures. The child will have normal hearing. Positioning. Have the child sit up, raise head on pillows, or lie on unaffected ear. Heat application. Apply heating pad or a warm hot water bottle. Diet. Encourage breastfeeding of infants as breastfeeding affords natural immunity to infectious agents; position bole-fed infants upright when feeding. Hygiene. Teach family members to cover mouths and noses when sneezing or coughing and to wash hands frequently. Monitoring hearing loss. Assess hearing ability frequently. The child or parent indicated absence of pain. The child is free of infection. The parents stated understanding of preventive measures. The child has normal hearing. Here’s a five-item quiz on otitis media. Which of the following instructions should Nurse Cheryl include in her teaching plan for the parents of Reggie with otitis media? Placing the child in the supine position to bottle-feed. Giving prescribed amoxicillin (Amoxil) on an empty stomach. Cleaning the inside of the ear canals with cotton swabs. Avoiding contact with people who have upper respiratory tract infections. D: Otitis media is commonly precipitated by an upper respiratory tract infection. Therefore, children prone to otitis should avoid people known to have an upper respiratory tract infection. A: A bottle-fed child should be fed in an upright position because feeding the child in the supine position may actually precipitate otitis by allowing the formula to pool in the pharyngeal cavity. B: Amoxicillin, when prescribed, should be given with food to prevent stomach upset. C: Cotton swabs can cause injuries such as tympanic perforation. They may be used to clean the outer ear, but they should never be inserted into the ear canal. Nurse Veronica is teaching a group of parents about otitis media. When discussing why children are predisposed to this disorder, the nurse should mention the significance of which anatomical feature? B: In a child, Eustachian tubes are short and lie in a horizontal plane, promoting entry of nasopharyngeal secretions into the tubes and thus setting the stage for otitis media. A, C, D: The nasopharynx, tympanic membrane, external ear canal have no unusual features that would predispose a child to otitis media. When assessing a child with a cleft palate, the nurse is aware that the child is at risk for more frequent episodes of otitis media due to which of the following? Ineffective functioning of the Eustachian tubes. Plugging of the Eustachian tubes with food particles. B: Because of the structural defect, children with cleft palate may have ineffective functioning of their Eustachian tubes creating frequent bouts of otitis media. A: Most children with cleft palate remain well-nourished and maintain adequate nutrition through the use of proper feeding techniques. C: Food particles do not pass through the cleft and into the Eustachian tubes. D: There is no association between cleft palate and congenital ear deformities. Chad, a 5-year-old preschooler, is brought to the clinic due to an ear problem. Which assessment data would cause the nurse to suspect serous otitis media? Bright red, bulging or retracted tympanic membrane and fever. Inflammation of the external ear and crust formation on the auditory canal. Sensorineural hearing loss and complaints of tinnitus. Plugged feeling in the ear and reverberation of the client’s own voice. D: Serous otitis media is manifested by a plugged feeling in the ear, reverberation of the client’s own voice, and hearing loss. A: A bright red, bulging or retracted tympanic membrane and fever suggest suppurative otitis media. B: Inflammation of the external ear and crust formation on the auditory canal suggest external otitis media. C: Sensorineural hearing loss and tinnitus indicate otosclerosis. Determine whether the ear infection has affected her hearing. Make sure that she has taken all the antibiotic. Document that the infection has completely cleared. Obtain a new prescription in case the infection recurs. C: The client should be assessed following completion of antibiotic therapy to determine whether the infection has cleared. A: Answer A would be done if there are repeated instances of otitis media; therefore, it is incorrect. B: Answer B is incorrect because it will not determine whether the child has completed the medication. D: Answer D is incorrect because the purpose of the recheck is to determine whether the infection is gone. 1. Which of the following instructions should Nurse Cheryl include in her teaching plan for the parents of Reggie with otitis media? A. Placing the child in the supine position to bottle-feed. B. Giving prescribed amoxicillin (Amoxil) on an empty stomach. C. Cleaning the inside of the ear canals with cotton swabs. D. Avoiding contact with people who have upper respiratory tract infections. 1. Answer: D. Avoiding contact with people who have upper respiratory tract infections. D: Otitis media is commonly precipitated by an upper respiratory tract infection. Therefore, children prone to otitis should avoid people known to have an upper respiratory tract infection. A: A bottle-fed child should be fed in an upright position because feeding the child in the supine position may actually precipitate otitis by allowing the formula to pool in the pharyngeal cavity. B: Amoxicillin, when prescribed, should be given with food to prevent stomach upset. C: Cotton swabs can cause injuries such as tympanic perforation. They may be used to clean the outer ear, but they should never be inserted into the ear canal. 2. Nurse Veronica is teaching a group of parents about otitis media. When discussing why children are predisposed to this disorder, the nurse should mention the significance of which anatomical feature? B: In a child, Eustachian tubes are short and lie in a horizontal plane, promoting entry of nasopharyngeal secretions into the tubes and thus setting the stage for otitis media. A, C, D: The nasopharynx, tympanic membrane, external ear canal have no unusual features that would predispose a child to otitis media. 3. When assessing a child with a cleft palate, the nurse is aware that the child is at risk for more frequent episodes of otitis media due to which of the following? A. Lowered resistance from malnutrition. B. Ineffective functioning of the Eustachian tubes. C. Plugging of the Eustachian tubes with food particles. D. Associated congenital defects of the middle ear. 3. Answer: B. Ineffective functioning of the Eustachian tubes. B: Because of the structural defect, children with cleft palate may have ineffective functioning of their Eustachian tubes creating frequent bouts of otitis media. A: Most children with cleft palate remain well-nourished and maintain adequate nutrition through the use of proper feeding techniques. C: Food particles do not pass through the cleft and into the Eustachian tubes. D: There is no association between cleft palate and congenital ear deformities. 4. Chad, a 5-year-old preschooler, is brought to the clinic due to an ear problem. Which assessment data would cause the nurse to suspect serous otitis media? A. Bright red, bulging or retracted tympanic membrane and fever. B. Inflammation of the external ear and crust formation on the auditory canal. C. Sensorineural hearing loss and complaints of tinnitus. D. Plugged feeling in the ear and reverberation of the client’s own voice. 4. Answer: D. Plugged feeling in the ear and reverberation of the client’s own voice. D: Serous otitis media is manifested by a plugged feeling in the ear, reverberation of the client’s own voice, and hearing loss. A: A bright red, bulging or retracted tympanic membrane and fever suggest suppurative otitis media. B: Inflammation of the external ear and crust formation on the auditory canal suggest external otitis media. C: Sensorineural hearing loss and tinnitus indicate otosclerosis. A. Determine whether the ear infection has affected her hearing. B. Make sure that she has taken all the antibiotic. C. Document that the infection has completely cleared. D. Obtain a new prescription in case the infection recurs. 5. Answer: C. Document that the infection has completely cleared. C: The client should be assessed following completion of antibiotic therapy to determine whether the infection has cleared. A: Answer A would be done if there are repeated instances of otitis media; therefore, it is incorrect. B: Answer B is incorrect because it will not determine whether the child has completed the medication. D: Answer D is incorrect because the purpose of the recheck is to determine whether the infection is gone.